“The Judges have spoken”, Stoneleigh Lothario has been judged by a string of international and New Zealand Judges. 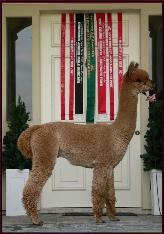 See his show credentials below; he is a true to type huacaya with a very superior fleece. Judges have scrutinized him and have commented on his high density and well-defined staples which go right through the neck and under the belly. He has a high amplitude crimp, a superb handling fleece and the judges have commented on has lack of guard hair throughout his fleece. He has good conformation and is an alpaca that always stands proud. Lothario’s mother Spicegirl won Reserve Intermediate Female at the New Zealand National Show in 2006 judged by international judge Jenny Jackson. Spicegirl was placed over white animals she also took out the Mid/Dark Fawn Color Championship at this show. Jolimont Attitude has sired a Supreme Champion at the Australian Nationals, his name is Camelot Tor. Camelot Tor is already making a name for himself with his progeny winning championships at last year’s Australian Nationals. Click on either image for an enlarged view.